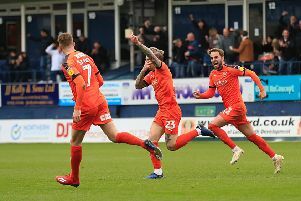 Hatters boss Mick Harford felt that his side proved they were a better team than play-off Doncaster this afternoon, after running out handsome 4-0 winners at Kenilworth Road. Going into the contest, visiting winger Matty Blair had stated: “I’ve said it from day one I believe we’re the best team in the league. “We’re just not the most consistent. When we played Luton back in September I thought they were the best team we’ve played. However, 90 minutes later, with league leaders Town registering 29 attempts at goal, scoring four of them, while Rovers’ barely laid a glove on their hosts, Harford said: “We all read it and we respect what he says, but we proved today that we’re a better team than Doncaster. “We don’t go around saying we’re the best team in the league, we were better than Doncaster today and that’s all that matters. Midfielder Luke Berry, who notched the fourth goal in stoppage time, added: “I know Matty Blair so I don’t think he meant it.